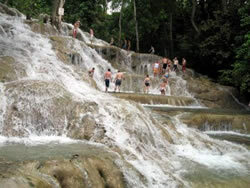 Dunns River Falls is a famous waterfall near Ocho Rios, Jamaica and a major Caribbean tourist attraction. Dunns River Falls located in Ocho Rios a few miles from the city center. The Dunns River Falls cascade over smooth lime stone rocks, through the tropical rain forest all the way to the white sandy beach below. You can climb up the water falls which is 183 meters (600 feet) high. The falls are made up of limestone which tiers gradually allowing you to climb from the beach to the top, taking some of the most spectacular scenery along the way. Prospect Plantation is a Jamaican agricultural property where you can see bananas, cassava, sugarcane, coffee, allspice and many other crops. Your guide will delight you with stories of the colorful history of the estate. 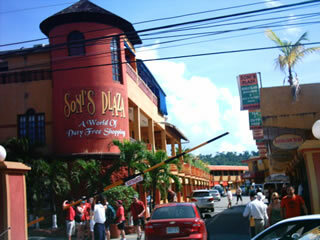 It combines the opportunity to enjoy an educational, relaxing and enjoyable trip to one of Jamaica's oldest plantation. The Plantation will expose you to the magnificent White River Gorge. Sir Harold Mitchell built a spectacular view of Jamaica's first hydroelectric power station here. The Great House at Prospect built in the early 18th century. It is fortified with loopholes against raids by privateers and buccaneers.